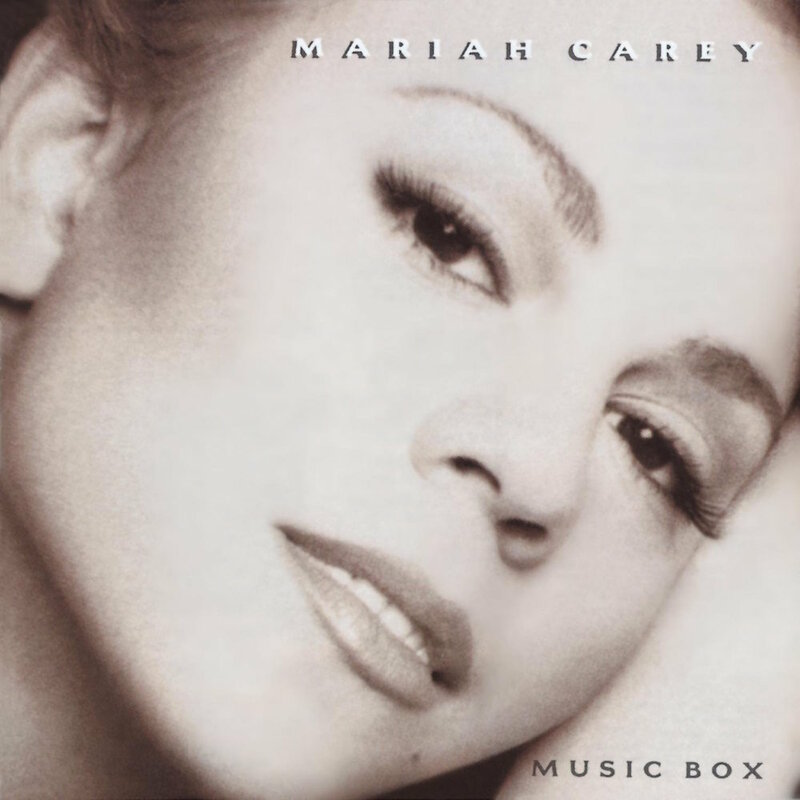 Today’s POP RESCUE from a fate unknown, is the 1993 third studio album, Music Box by Mariah Carey. This isn’t the first time I’ve heard this album – I had it about 20 years ago, and when I saw it again, I decided I’d give it another go. The album opens with the gentle tinkling start of lead single Dreamlover, and the trademark high-pitched note from Mariah. A fantastic slick RnB beat kicks in with a wonderful snare. It’s backed by a gentle bass and guitar riff. Mariah’s vocals here are confident, strong, and also perfectly partnered to this chilled out track. This is a wonderful song, and is, in my opinion, Mariah at her peak, although sadly it got stuck at #9 in the singles chart. This is followed by Hero, the second single from the album, which gave her a #7 UK hit. This track begins with Mariah pitched against a piano, as bass and light percussion gradually builds up. Again, her vocals here are flawless, and the song flows perfectly along with her. Next up is the fourth and final single taken from the album Anytime You Need A Friend, which is another ballad, but this time it features a gospel choir that works perfectly in contrast to Mariah’s vocals, allowing her to focus on hitting some incredibly high notes with the strength of the choir behind her. The song plods along, although at times the vocals feel a bit rock. The track reached #8 in the UK. Title track Music Box follows this, marking the first non-single track of the album. The track opens with… yes, you guessed it… a music box playing a lullaby. Mariah ‘oohs‘ and ‘umms’ her way in in a way that would have done Whitney Houston proud. This song begins as a very basic track, with finger clicks and bass joining in for the second verse. The song focuses on Mariah’s soft, breathy vocals, and gives her plenty of space to show this off, with the song barely registering a pulse. Next up is Now That I Know, a song co-written with and produced by the men of the moment, David Cole and Robert Clivillés of C + C Music Factory. The tempo is up here, and gives Mariah a track that wouldn’t sound out of place on a Cathy Dennis or Dina Carroll album. This is the most dance-y I’ve ever heard Mariah, and whilst this is pretty much a complete contrast to anything so far on this album, Mariah’s vocals make light work of the dance vocals. Great stuff! Never Forget You opens with a big country music ballad sound. This is a collaboration between Mariah and producer Babyface, and it kind of shows. There’s an element of ballad-by-numbers and in its chorus it reminds me of Boyz II Men‘s hit End Of The Road, which he also co-wrote and produced. This song was released as part of the double-A single with….. ..Without You, which gave Mariah a huge hit. This song was originally by group Badfinger in 1970, but most notably famous up until 1993, by Harry Nilsson. This version, which gives Mariah a piano to partner with, and a ton of space to really let her vocals reach wherever they want to. It’s an epic track, and a fantastic showcase of her vocals. This song gave her her first UK #1 single – a feat she would (so far) only repeat in 2000 with the help of boyband Westlife. This is followed by Just To Hold You Once Again, which quietly arrives with some near-church organ and ‘oohs‘. This is quite a minimal ballad, giving Mariah another platform to show off those softer Whitney-esque vocals, backed by some gentle gospel styled backing vocals. At about 2mins 30s there’s some great piano and bells added in, that helps the song to build up into the final push. The C + C Music Factory team are back for another go with I’ve Been Thinking About You, and again it’s a dance number. The beat and synths remind me a lot of the bouncy 1994 PJ & Duncan hit Let’s Get Ready To Rhumble at times, but Mariah just about manages to keep it safely away from there, with yet more dance vocals. Penultimate track All I’ve Ever Wanted is up next and this is another breathy ballad that again pitches Mariah’s vocals against piano and some gentle strings. The predictable drum fill signalling the second verse arrives, and the beat arrives, but yet the music holds back somewhat. Her voice is beautifully delicate and flawless. The album closes with Everything Fades Away (Bonustrack), which is a bit of a downbeat song, with a warm backing choir. This reminds me of something that you’d find tucked away on a George Michael or Tasmin Archer album. There’s a really nice male vocal section in the middle, leading the song towards its faded end. A really nice track to close with. Over all, this is Mariah Carey at her peak, showing off her incredible vocal range, but not over-doing it, or ladening her songs with self-referencing lyrics and pointless collaborators. Production is slick, and that credit goes to her collaboration with long-termer Walter Afanasieff. The dance tracks are refreshing as this album is very ballad heavy. If you only have one of her albums, make it this one (unless you like Christmas… and then get Merry Christmas instead). Where is Mariah Carey now? Mariah Carey has since gone on to record 10 more studio albums, release countless singles, collaborated with a wide range of artists, and star in a number of films. Just a few years after the success of Music Box, she released her seasonal hit All I Want For Christmas Is You, taken from her first Christmas album Merry Christmas in 1994. It has since sold more than 15 million copies worldwide and become the biggest selling Christmas album of all time. Despite this, it only reached #32 in the UK. She has won a vast array of awards for her music, specifically due to her impressive five octave vocal range. In January 2015 she announced that she would be taking a residency show in Las Vegas, so it may be a little while until she releases anything new. 1993 UK CHART POSITION: #1, certified 5x Platinum. POP RESCUE COST: 50p from The Money Tree pawnbrokers. Posted in 1990s, C+C Music Factory, Mariah CareyTagged 1993, album, Anytime You Need A Friend, Babyface, Badfinger, David Cole, Dreamlover, Harry Nilsson, Hero, Music Box, Never Forget You, Nilson, review, Robert Clivillés, Walter Afanasieff, Without YouBookmark the permalink.